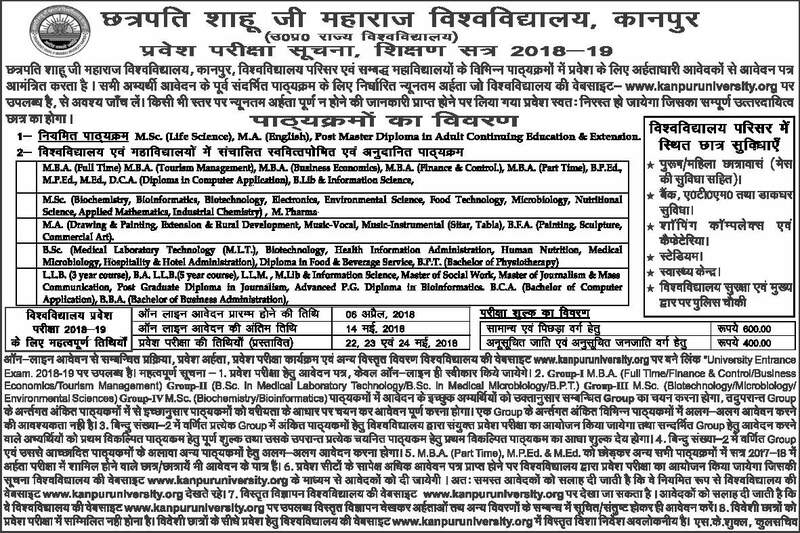 CSJM Kanpur University Admission 2019 Online Registration Form for private and regular courses in Kanpur University will be held through entrance exam. For Both UG PG Courses BA B,com MA M.com M.sc syllabus is made. Chhatrapati Shahu Ji Maharaj University, formerly called ad CSJM Kanpur University. All types of Admission taken under Private and Regular basis. CSJM Online Form for Private or Correspondence Admission 2019 Graduate and Post Graduate Courses soon updated on official website www.kanpuruniversity.org. Chhatrapati ShahuJi Maharaj Kanpur University is a Uttar Pradesh State Govt University Invited you to Online Application Form for the 2015-16 Admission. 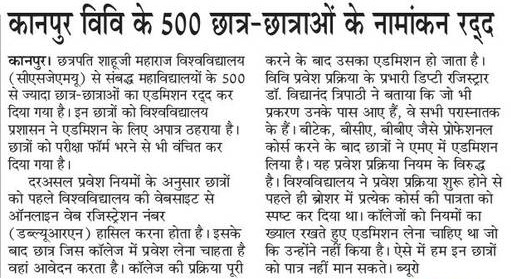 CSJM Admission Latest News 2019: Kanpur University 500 Students Admission cancelled due to not selecting eligible courses. 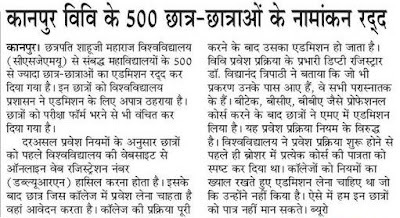 On 4 October Kanpur University students who have apply for CSJMA MA Admission their admission is rejected and they will not be able give written exam also. Under Kanpur University admission rules candidates have to opt online web registration number after that where they wants to get admission in college their they can apply. Students who rejected in MA Courses are: B.C.A, B.TECH, B.B.A Professional courses. Kanpur University Syllabus 2019 Model Question Paper: Contains Multiple Choice question with high school standard General Knowledge, Maths, Reasoning and Hindi. Based on Subject you have applied. Their is no negative marking. Under Graduate UG Courses : B.A., B.Com, M.A, and M.Com LLB law, BA LLB, BCA, BBA, BPT and Other Diploma Courses. Payment Mode: General, OBC : 600, SC, ST : 400 Student Can Pay the Exam Form Fee through Banking Online categories such as Challan, Debit Card, Credit, Card, and Net Banking Mode. Educational Qualification: For UG Course 12th pass according to subject Arts Science, Commerce and BPED Physical Education etc.For Kanpur University pg course admission should have graduate from recognized university. Kanpur University Admission fees: For single Single Subject : 534+Bank Charge. Starting Dates For Online Application Form: 6 April 2019. 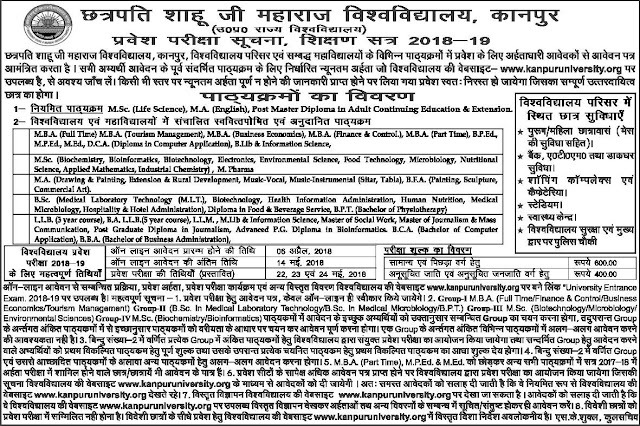 Kanpur University Admission Last Date: 14 May 2019. Entrance Exam Date Held on: 22 May 2019 to 23 may, 24 May 2019. Kanpur University admit card available 25 May 2019. How to Apply: Candidates Can Only Apply Through website Online Application Form. Not Other Mode Available. Now Before Apply the Read the Notification Carefully. Kanpur University Result 2018 will be declared after entrance exam. Candidates will wait for CSJMU Result 2018. In second stage after that Kanpur University counselling letter 2017 according to there for below admission in colleges of Kanpur University.